Out here in Arizona, we can’t wait for the fall weather. But before we cool things off, we’re celebrating the end of summer with our favorite peach recipes. While peaches are available in most regions of the U.S. from May to October, their taste peaks in the late summer months, so take advantage of this seasonal favorite now. The versatile fruit stars in a number of desserts and also makes the perfect accompaniment to savory dishes. 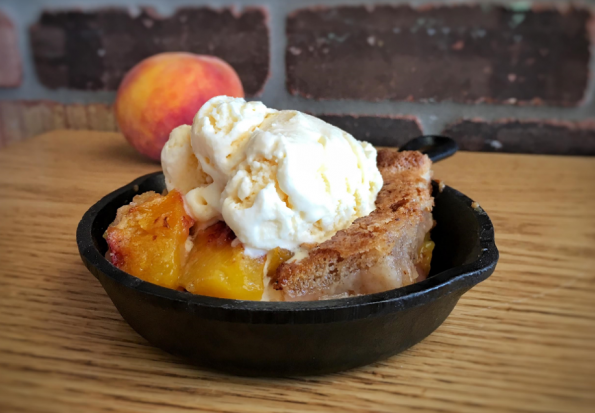 In honor of National Peach Month, Julie Moreno, award winning chef and owner of Jewel’s Bakery and Cafe has shared a recipe for her Gluten Free Peach Cobbler! Now not only can your try their delicious treats there, but now you can make one at home! You can even buy the flour used at Jewel’s Bakery and Cafe! Jewel’s began in 2009 when owner Julie Moreno’s daughter, Sophia, was having severe abdominal issues and was ultimately hospitalized. The doctors had no clear answers. After years of bellyaches and no real answers from conventional medicine Julie Moreno turned to naturopathic medicine for answers to find out Sophia had severe allergies to gluten. She later became allergic to many other items and had a very restricted diet. In the meantime, Julie searched to find ways to feed her picky family including 6 kids and her husband gluten-free meals. Not being happy with the readily available food she experimented with many flour blends to come up with the ultimate blend that she could use to make anything. Her flour blend doesn’t just make things taste OK, most often they taste better than their gluten counterparts. The word spread and Julie was baking full-time out of her house. Her orders outgrew her house and she expanded into a full bakery and cafe winning awards in her first year of business. Jewel’s Bakery and Cafe offer the best of everything from our breads to our fried donuts are made daily in house with fresh ingredients, that are as local as possible. Serving breakfast and lunch with hand-brewed Cartel coffee & locally blended organic teas. Melt butter and place in 8x8 pan. Whisk flour, sugar, cinnamon, baking powder and salt. Add milk; whisk to form a smooth batter. Pour batter into pan, then place peaches over batter. Bake until batter browns and peaches bubble, 50 to 60 minutes. This looks so yummy! Peaches are at their peak in Georgia right now so I can’t wait to try them in this cobbler! !